Rated R for some sexual material and language. The idea of just walking away from a seemingly settled life is one that’s gotten a pretty good workout in both film and literature. The 2008 short story “Wakefield,” by American literary giant E.L. Doctorow, put a particularly funny and dark spin on the theme. One evening after a tough commute back from the city, New York suburbanite Harold Wakefield chases a raccoon that scurries up to the attic of his house’s standalone garage. Once secure that the pest is gone, Wakefield pauses. From the garage’s windows he can see inside his own house. His beautiful wife Diane (Jennifer Garner), with whom married life has soured; his twin daughters, who treat him as a stranger. Wakefield, on an impulse, decides to stay in the garage overnight. To see what happens, at least that what he thinks at first. Bryan Cranston plays the title role, and in the opening scenes, as he strides through Grand Central Station and dictates dark legal edicts and predictions into his iPhone, he exudes cold, buttoned-up authority. Once he’s set up camp in the garage attic, he becomes curious about their reaction to his disappearance, curious about the people Diane consults with—her mother, “the widow Babs” as Wakefield refers to her, and a younger, handsomer colleague of Wakefield’s are among them, and they both arouse his ire, which we infer he never kept well-hidden in his former domestic life anyway. But more than that, he’s cackling with glee over all the misanthropic bile he can cook up while looking at them. Referring to his former life as “a prison cell where the light is never turned out,” he lets his petty sadistic misanthropic thoughts run riot even as he scavenges the neighborhood dumpsters for food. The premise sometimes feels like Melville’s Bartleby the Scrivener channeled through John Cheever. But Doctorow was not as despairing a writer as those other American masters. He was a progressive humanist, albeit an always tough-minded one. Swicord brings this perspective to bear on her cinematic vision of Doctorow’s story. When Wakefield is discovered by a couple of sweet-wide-eyed residents of the house next door—a learning center for differently-abled children, which, Wakefield boasts, he was all in favor of, but Diane expressed many not-in-my-backyard concerns about—the hardened viewer may roll his or her eyes in anticipation of the threatening teachable moment in which Wakefield rediscovers the joy of family. While his interactions with these two kids, played with great unaffected loveliness by Pippa Bennett-Warner and Isaac Leyva, do yield a share of magic moments, that’s not the epiphany to which the movie is headed. Because Wakefield’s too twisted up for that. The sexual dynamic of his marriage, the dissembling with which he won his wife over, and other related factors make him unable to let go of his attachment even as he lets all his responsibilities go to hell. 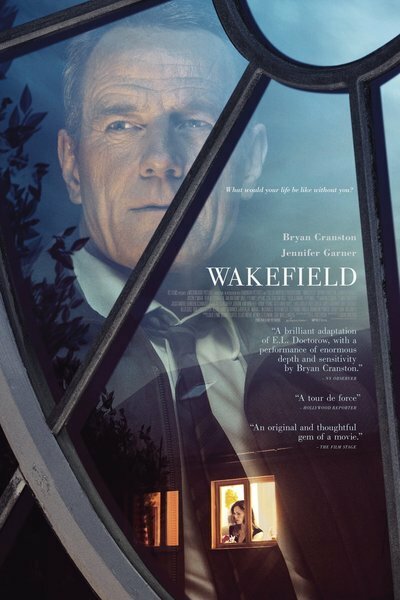 Once Wakefield is near full scary-looking derelict mode, the movie flashes back 15 years, to his courtship. And here it stumbles a bit, because while Jennifer Garner at 45 can still pretty plausibly play 30 or even 25, Bryan Cranston at 61 doesn’t do 45 very well, and I don’t think he’s supposed to be playing 45. I know this is the sort of objection brought up by folks that Alfred Hitchcock disdained as “plausibles,” but given that the movie is so well-crafted in other respects, the effect of no effect—aside from makeup making the actors look a little ruddier, there seems not to have been much effort put into de-aging—threw me out of the movie for a little while. That aside, “Wakefield” is kind of a wonder. (Especially at a time when so many American indie films are steeped-to-drowning in the gestalt of the Millennial couch-sleeper.) The frankness of the key performances is consistent and sometimes startling. Even though half of her screen time consists of her being seen but not heard, Garner has a consistent crispness; her character is simultaneously transparent and slightly enigmatic. And master Cranston clearly recognizes the meal a role like Wakefield represents, and takes his time with it. He plays the part clean and plain, never nudging the audience for sympathy but making them want to ride shotgun with him on his lunatic journey.